The U16 2013 European Championship for Women Division A final will be between the defending champions Spain and the 2013 European Youth Olympic Festival gold medallist, the Czech Republic. The two nations contested the 2006 championship final which Spain won (80-78). 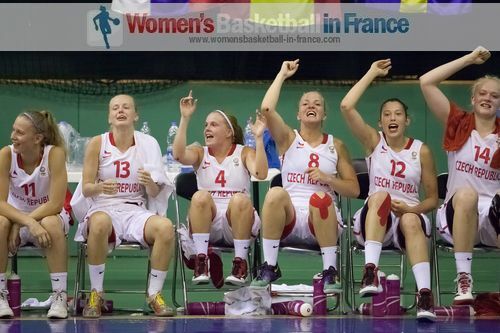 France and Russia won their classification games and will play off for fifth place and the last FIBA Europe zone spot at the 2014 FIBA U17 World Championship for Women. For the hosts Bulgaria and Lithuania, they return back to Division B, a year after their promotion. Belgium and the Netherlands face off in the last relegation match on the final day of the tournament. The other winners on day 8 were Sweden and the Slovak Republic in the 9th - 12th classification round. The Czech Republic have qualified for their third U16 European Championship final after knocking out Italy (73-54) in the second semi-final. The match was rather scrappy for the first 25 minutes with neither side able to impose their game (35-35). The Czech Republic then started to run the floor quicker with Karolina Maleckova back in the game. Within a twinkle of an eye they were 10 points clear (47-37). Italy were powerless to deal with the inside presence of Julia Reisingerová (19 points, 13 rebounds) and the speed of Maleckova. The game passed them by. For Italy Mariella Santucci led Italy with 14 points, 6 rebounds and 3 steals. Spain have qualified for their 9th U16 European Championship for Women Division A final after a hard fought match against Hungary (50-49). 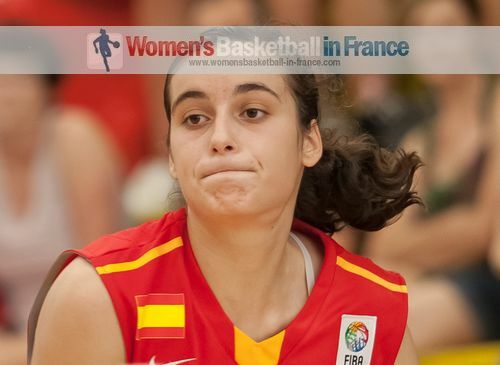 Angela Salvadores (in picture) from Spain was the player of the match with 22 points. She made her first five shots of the match and hit what turned out to be the game winning shot with 54 seconds to play. The first 20 minutes of the game were rather crispy with both sets of players trying hard to follow their coaches' instructions. Hungary were a little bit more disciplined and led (27-25) at the break. 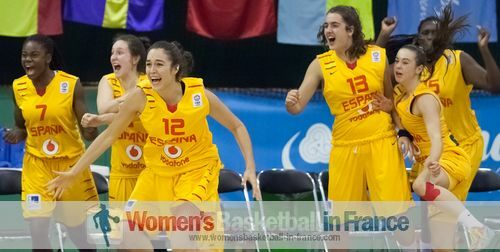 Afterwards Spain cut off the Hungarian offensive threats, Debora Dubei (17 points) and Eniko Kuttor, while playing their way into the match. Iho Lopez (8 points, 3 blocks) with some personal exploits allowed Spain to edge in front by the end of the third quarter. Spain appeared to be finally running away with the game leading (34-35) with eight minutes to play. But Hungary picked themselves up with Nina Aho and Virág Kiss (11 points) hitting their shots. If not for Kiss having a bad time from the free-throw line and great defensive work by Cecilia Muhate (9 points), Hungary could have been in front. Instead the teams were level (48-48) with 91 seconds to play. Dominika Böröndy' s three-pointer to level the match was not enough to lift Hungary as Salvadores hit the shot of the match for Spain. The last 54 seconds were messy and Hungary missed the chance to avenge their defeat to Spain in 2012 by missing the last shot of the game. In the first game in the Albena arena, France came out victorious (70-65) against Croatia. France will contest the match for fifth place and a spot in the 2014 FIBA U17 World Championship for Women against Russia. Croatia spent 50% of their time shooting from beyond the arc. They finished the game hitting 11-from-35. Ivana Dojkic from Croatia was the best shooter with 6-from-10 from behind the arc in a her game high 25 points. 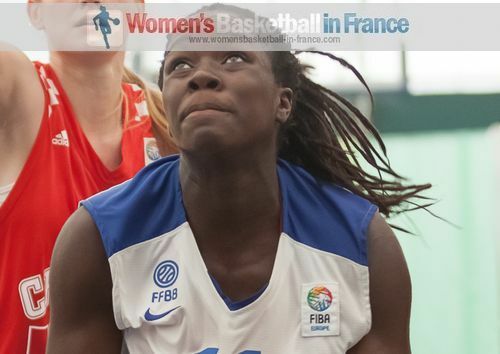 However France led for most of the match and with Ornella Bankole (in picture above) leading the way with 16 points and 19 rebounds, France were not leaving this European Championship without contesting for fifth place. Russia blew away Latvia (71-37) in the last 5th - 8th place classification game. Latvia never settled. Once Digna Strautmane fouled out 49 seconds into the third quarter Latvia were finished and managed just 10 points the rest of the way. The game highlights from both games are available in the right menu. The European championship for Latvia and Croatia is over and they will play off for 7th place. In the 9th -12th place games Sweden and the Slovak Republic beat Greece and Turkey respectively. Belgium went on a 22-0 run from the 29th minute until the 37th minute to end Bulgaria's one year stay in Division A. Belgium won the match (69-43) and will face the Netherlands in the last relegation match. Lithuania had won the Division B title in 2012 and are also on their way back to Division B after being rolled over by the Netherlands (52-84).